You make a hole and then you put your string through it. Deghotleye (awl) – that was a very important tool. 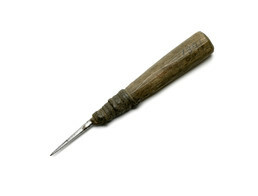 The awl is an essential tool for traditional arts, used to perforate animal skins and birch bark and to drill holes in wood for lashing together sleds and webbing snowshoes. To sew a seam, a woman traditionally pierced both pieces of skin with an awl then laced sinew thread through the holes. This Koyukon awl is tipped with a sharpened iron nail, while older points were made of bone. Eliza Jones: So this is a wooden handle and that might be an old-time nail or something. And then this is just rawhide. Trimble Gilbert: Yes. . . . We call them tthah [awl]. Judy Woods: . . . Moccasins, we used to make holes in them. Eliza Jones: That’d be like an awl? Eliza Jones: They make holes, and then you put this string through there. Judy Woods: You could make mitts. . . . Deghotleye [awl]. Eliza Jones: It’s used for making holes. . . . You make hole in it and then you put this kind of string through it. Deghotleye [awl], that was a very important tool. Phillip Arrow: My mom had a round one. Eliza Jones: How did the handle look, the same? Eliza Jones: And with the rawhide on there too? Eliza Jones: So I say deghotleye [awl]. How do you say it? Phillip Arrow: Diggatth’iy [man’s awl].